Interactive! Through practicals you learn to facilitate! The training was fun! It was interactive and I was all the time involved. Especially the practicals and doing it yourself were stimulating. 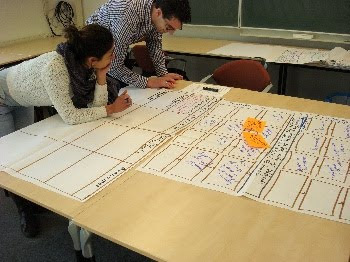 These were the comments from participants coming from ICCOenKerkinActie and Oogzorgnetwerk, who participated in the training facilitation methods on the 26 - 27 April 2010 in Nijmegen. Participants got acquainted with the Technology of Participation methods (ToP). These are basic facilitation methods, which provide a solid basis in facilitation. 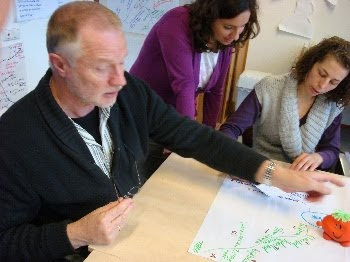 ToP has been developed by the Institute of Cultural Affairs and is applied in all continents over the world and in different sectors, such as development, government and the commercial sector.Mind mapping, the caroussel, the basic conversation method, the brainstorm workshop method and the action planning were part of the tools with which was practised by the participants. 'We got a clear perspective about community youth development in The Netherlands'. 'Youth workers spend much time on the street to make contact with youth', 'Youth participation is one of the keys to success! 'We got a broader perspective on how community youth development projects are linked to the national governmental policies. ' These were some of the comments by the Moldovan delegation which visited The Netherlands from 14 - 23 April, 2010. The delegation was composed of representatives from central and local government, the State University of Moldova, youth leaders and adult support leaders from 4 villages, youth resource centres and Pro Community Centre. Building capacities - I have a broader perspective! "The training was complete. We tackled a lot of topics, but we had enough time to practise and internalise the concept of capacity development. I did not think about how to involve parents as part of the structure of the local school. They are part of building sustainable structures. Now I have a much broader perspective what capacity development is!" I learned as a leader until now, I have to work, work, work........ Just through working I can achieve something, to be known by others, by many others and to promote these activities. This is one of the comments from the youth leaders, who participate in the project 'Youth in the Center' which is aiming at building sustainable structures for youth work in Moldova. Following is an interview with one of the youth leaders. Facilitation - practical, useful and it is fun! "It is practical, useful and facilitation is fun!" This was one of the comments from the participants who felt that she should have had this course 5 years ago. Others commented: "The course has a good balance between listening, discussing and doing. The methods are relevant. Through systematisation you discover what you have been doing intuitively. The training is a must for our project leaders."